Most new businesses start their search on the internet or in the car. 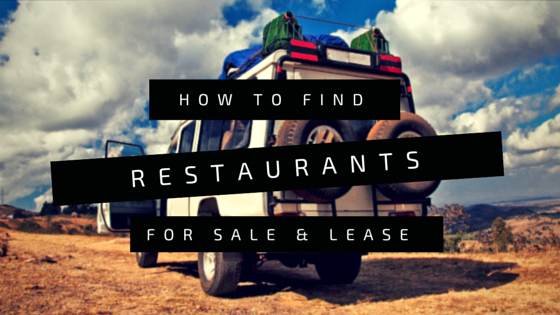 We will explore common methods to find restaurants for sale and lease. If you have ever purchased a home, you have probably heard of the MLS or Multiple Listing Service. If the house is listed with a real estate agent you will find it on the MLS. Today most residential listings can be found on numerous real estate websites. Unfortunately, there is no centralized MLS for commercial real estate or restaurant properties. There are numerous free and paid services that advertise some of the available properties. Loopnet.com is the most well-known website for commercial properties. As a basic member, Loopnet.com is free to search. As a free member, you only receive a limited number of the available listings. To get the most from Loopnet.com, you will need to subscribe. Current pricing is $89.95 per month or $60.00 for 24 hours. RestaurantforSaleorRent.com is a new site that is free to both list and search restaurant sites. As of this post, the information is limited but expected to grow. The search functionality on Craigslist is poor so it’s time consuming. If you have the patience to scan through hundreds of “office/commercial” listings, you will find a handful of restaurant properties. There are numerous websites advertising businesses for sale. Due to the seller’s desire to keep the sale confidential, the information is limited and requires you to register and sign a non-disclosure agreement prior to receiving any information. Buyer Beware! Many business brokers are just looking to make the largest commission possible and sell only their listings. Their main goal is to get you into their email program and send you THEIR listings without any regard whether or not the property or business fits your needs. You are also agreeing to Dual Agency in many cases when you sign the Non-Disclosure. This is the least used method by first-time restaurateurs. Rather than looking for available restaurants for sale and lease, specific properties are selected with the intent to buy the existing business from the current tenant or to negotiate a future lease with the landlord when the current lease expires. This can be a very time-consuming process and requires the patience to possibly wait months or years into the future for a specific site. If you wish to take this approach you will need to research the contact information for the landlord and existing business owner. A restaurant real estate broker can assist you with researching and contacting the parties involved. The term “real estate broker” or “agent” is very broad. It’s important to understand the different roles of real estate brokers and how they are involved with different aspects of commercial real estate. A broker is required to meet more stringent educational requirements; an agent works under a Broker’s license. Most commercial real estate agents or brokers specialize in a specific type of property or geographical area. For example office agents/brokers specialize in office buildings and retail agents/brokers typically lease or sell retail properties and shopping centers. WARNING!! It’s not a good idea to work with a broker that sells homes or works on a property type such as office buildings or apartments if you are opening a restaurant. In most cases using a broker will save you time, provide access to properties that are not public knowledge and help negotiate a better lease than you would on your own. Please read Should You Use a Broker and How Do You Chose the Right Restaurant Broker for a more detailed discussion about what you need to know about real estate brokers and agents.